Today’s Collecta is at the Church of St. Quiricus with the Station at St. Martin “ad montes” The Church of St. Quiricus (at one time St. Quiricus and Julitta, Oriental martyrs) is at the foot of the Quirinal hill. Through the zeal of Pope Symmachus, two oratories were erected beside the ancient titulus equitii, dedicated to the first two confessors to whom after the martyrs liturgical cultus was paid, Sts. Martin and Sylvester. It is located on the Esquiline hill. The Mass dates only from the time of Pope Gregory II; the sung parts are from other feasts. Both the Epistle and the Gospel recount a miracle of raising the dead to life; Elisha, who is a figure of Christ, raises the son of the Sunamite woman; Jesus raises the son of the widow of Naim and gives him back to his mother. St. Martin of Tours was celebrated as the resuscitator of three dead persons. The story of Elisha is an example of the discretion needed by superiors in dealing with those under their care. Grant, we beseech You, almighty God, that we who are chastising the flesh by fasting, may rejoice in this holy practice and thus, with earthly passions subdued, we may the more readily direct our thoughts to heavenly things. Through Jesus Christ our Lord, Who liveth and reigneth with Thee in the unity of the Holy Ghost, one God Forever and ever. R.Amen. In those days, a Sunamite woman came to Eliseus to Mount Carmel: and when the man of God saw her coming toward him, he said to Giezi his servant, Behold that Sunamitess. Go therefore to meet her, and say to her: Is it well with you, and with your husband, and with your son? And she answered, Well. And when she came to the man of God to the mount, she caught hold on his feet: and Giezi came to remove her. And the man of God said, Let her alone: for her soul is in anguish, and the Lord has hid it from me and has not told me. And she said to him, Did I ask a son of my lord? Did I not say to you: Do not deceive me? Then he said to Giezi, Gird up your loins, and take my staff in your hand and go. If any man meet you, salute him not: and if any man salute you, answer him not: and lay my staff upon the face of the child. But the mother of the child said, As the Lord lives, and as your soul lives, I will not leave you. He arose therefore, and followed her. But Giezi was gone before them, and laid the staff upon the face of the child, and there was not voice nor sense: and he returned to meet him, and told him, saying, The child is not risen. 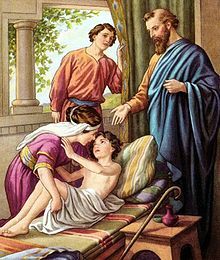 Eliseus therefore went into the house, and behold, the child lay dead on his bed: and going in he shut the door upon him, and upon the child: and prayed to the Lord. And he went up and lay upon the child: and he put his mouth upon his mouth, and his eyes upon his eyes, and his hands upon his hands, and he bowed himself upon him: and the child’s flesh grew warm. Then he returned, and walked in the house, once to and fro: and he went up and lay upon him: and the child gaped seven times, and opened his eyes. And he called Giezi, and said to him, Call this Sunamitess. And she being called, went in to him. And he said, Take up your son. She came and fell at his feet, and worshipped upon the ground: and took up her son, and went out, and Eliseus returned to Galgal. Have regard, O Lord, to Thy covenant, and forget not to the end the souls of Thy poor. V. Arise, O Lord, judge Thy own cause: remember the reproaches of Thy servants. At that time, Jesus went into a city called Naim; and there went with Him His disciples, and a great multitude. And when He came nigh to the city, behold a dead man was carried out, the only son of his mother; and she was a widow, and much people of the city were with her. And when the Lord saw her, He had compassion on her, and said to her, “Weep not.” And He came near, and touched the bier. (And they that carried it stood still). And He said, “Young man, I say to thee arise:” and he that was dead sat up, and began to speak. And He delivered him to his mother. And there came a fear on them all and they glorified God, saying, A great prophet is risen up amongst us, and God hath visited His people. O Lord, make haste to help me: let all those be confounded that desire evils to Thy servants. Purify us, O merciful God, that the prayers of Thy Church, which are pleasing to Thee, may become the more pleasing from the purified hearts with which they bring the gifts of devotion. Through our Lord Jesus Christ Thy Son. Who liveth and reigneth with Thee in the unity of the Holy Ghost, one God Forever and ever. R.Amen. O Lord, I will be mindful of Thy justice alone; Thou hast taught me, O God, from my youth; and unto old age and gray hairs, O God, forsake me not. Suffer not Thy heavenly gifts, we pray Thee, O Lord, to become the occasion of judgment to those who receive them, for Thou hast provided them unto the healing of Thy faithful. Through our Lord Jesus Christ, Who livest and reignest, with God the Father, in the unity of the Holy Ghost, one God For ever and ever. R. Amen. O God, teacher and ruler of Your people, drive out the sins that assail them, so that they may ever be pleasing to You and secure under Your protection. Through Jesus Christ, thy Son our Lord, Who liveth and reigneth with thee, in the unity of the Holy Ghost, ever one God, world without end. R. Amen. AbrahamAmen.Gloria PatriGodHoly GhostHolySpiritin nómine tuo"IntroitJerusalemJesuLordmaryMonday Lent IV: Missa "DeusO LordPhariseesSunday's Mass: "Laetare" Lent IVThursday Lent IIThursday Lent IV: Missa "Lætétur cor"